George was born on March 26, 1912 on a homestead at the northeast edge of Fort Clark, the son of Benjamin and Harriet (Cacek) Vratny. Benjamin worked for Charles Toman, Sr. a tailor in Mandan. George's mother married Charles Toman in August of 1914. George was later adopted, knowing only Charles Toman Sr. as his father. His parents had both emigrated from Bohemia which was then part of the Austrian Empire. Charles had moved to the US in 1889 at the age of 16 to Chicago and initially lived with his two brothers and sister. Charles was a tailor by trade, moved from Chicago, IL to Madison, WS. Charles opened his first shop in Tyndall, SD but moved to Mandan in 1904 to settle near his brother who was farmsteading near Judson. As a young man, George was very active in Boy Scout activities. He would later serve a one of Mandan's scoutmasters. A member of Mandan High School's class of 1930, George was a member of the Brave's football team. He was elected president of his sophomore class, was a member of student council as well as the high school's debate team. George studied civil engineering at North Dakota State University - Fargo and received his degree in 1935. He also was a member of the NDSU Lincoln Debate club. He also participated in the Army ROTC program, reaching the rank of Cadet Major and led Company B there. He continued his post-graduate engineering studies at the University of Minnesota and the University of Wisconsion-Madison. After graduation, he worked for T. R. Atkinson, Consulting Engineer in Bismarck. He also served as the associate sanitary engineer for the North Dakota State Department of Health for five years until called to active duty in World War II with the 188th Field Artillery Regiment from Mandan. Graduating from Fort Sill OK with the 188th FA, he was assigned to Fort Lewis WA but was identified for advanced command and staff training at Ft. Leavenworth, KS. During the war, he sustained an injury at the St Lo breakthrough where he was commanding the 183rd Field Artillery Battalion. After spending 17 months in the US Army Hospital System and a total of 5 years in Army service, Lt. Colonel Toman retired. He was awarded the Purple Heart and the Bronze Star Medal. George Toman grew up with three brothers Edward, Bernard and Ray. George joined his brothers in a conglomerate partnership composed of Sanitary Plumbing and Heating, Toman Cleaners and Toman Engineering Company. George established and operated the engineering and surveying branch, which provided engineering services for communities in the Western Hemisphere with Mandan serving as the headquarters office. Offices and staff were maintained at Asuncion, Paraguay; Washington, DC and Boissevain, Manitoba. 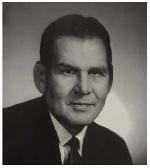 George served as city engineer for Mandan during the 1950s and coordinated major city infrastructure expansions after the population impacts of MDU�s Heskett Plant and the Mandan Refinery. He retired from active practice in April of 1979, at which time the Toman Brothers Partnership was dissolved. George was a member of ND Society of Professional Engineers (NDSPE) and was the first president of the ND Consulting Engineers Council. He was a member of the Masons, Mandan-Bismarck York Rite Bodies, Scottish Rite Valley of Bismarck, Order of the Eastern Star, Mandan Rotary Club, American Legion and Veterans of Foreign Wars. In 1968, he received NDSPE's Elywn Chandler Award, the organization's highest honor, for his "contribution to the advancement of the engineering profession." George married Helen Emily Dill of Minot on August 14, 1938. Two daughters were born to this union, Patricia Ann (Eck) and Helen Louise "Penny" (West). Helen Emily Toman passed away on July 28, 1968. George married Margaret (Pierce) Huddleson on July 22, 1969. She died on May 16, 2002. George died on November 9, 2000. He and both wives are buried in Union Cemetery, Mandan.